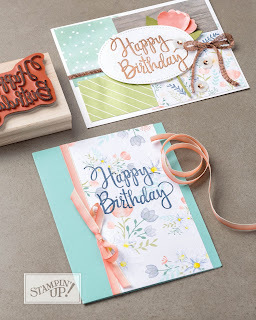 Stamp with Melva: Are you looking for quick and easy Birthday Cards? Are you looking for quick and easy Birthday Cards? I wanted to share with you some cards that are quick and easy to make when you need a Birthday card. These cards use the Stylized Birthday stamp. First, two cards that use the Stylized Birthday stamp set (Item 141828). This is a great stamp and you can use it to with a little bit of Designer Series Paper from the Color Theory Paper Stack (Item 144193) - paint chips are definitely on trend at the moment, and a few Glitter Enamel Dots (Item 144200), you have a great card. Just change the colours and it's perfect for masculine or feminine birthdays. I love Berry Burst from the new In Colours and this card that I made definitely shows it off. The next card was made by my friend Ginny Duncan and she's made a fancy fold card using the same stamp, but has also added some swirls cut out using the Swirly Scribbles Thinlit Dies (Item 141497). Here's some samples from the Stampin' Up! Annual Catalogue (Page 80) using the stamp set. Interested in placing an order? You can go to my Online Store or email me your order. Remember if you are shopping through the Online Store and your order is less than $200, use my Host Code CYH6FWC6 and I'll send you a set of 4 cards as a Thank You gift including the instructions so you can make at home. And to make it even better! Bonus Days are back! For every $60 CAD you or you spend July 1–31 (before shipping and tax), you’ll get a $6 CAD Bonus Days coupon that you can use August 1–31. Woohoo!